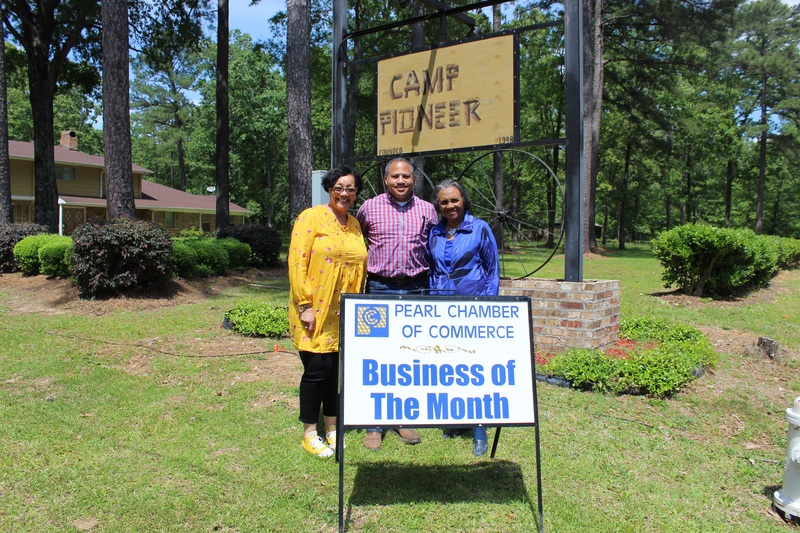 Congratulations to Pioneer Ministries on being selected as the Pearl Chamber of Commerce Business of the Month. Camp Pioneer is located on Old Whitfield Road in Pearl and is celebrating their 70th anniversary this year. Kids from all over the state and some from out of state enjoy coming to Camp Pioneer for a time of Christian fun and learning. They are taught values, character development, respect for others and other life lessons as well as how to dress, speak and be a leader. They have so much fun camping in the log cabins, swimming in the in ground pool, playing basketball in the gym and playing on the challenge course that has zip lines, a climbing wall and so much more. They enjoy campfires and learning about nature but most importantly they learn about Jesus Christ and grow spiritually. Camp Pioneer is a non-denominational non-profit that has several fundraisers throughout the year to help with scholarships. Their annual golf tournament is coming up on Thursday May 10th at the Pearl Municipal Golf Course. They are accepting teams and hole sponsors at this time. For more information call 601-939-3659. Pictured are Executive Director Ronald Bingham, Lisa Cummings Willis, Program Director and Ann Bingham, retired Camp Pioneer Director.